Crispy Roast Belly Pork Fried Rice အေခါက္ကင္ ထမင္းေၾကာ္ Chaw Su will show you how to make this Crispy Roast Belly Pork Fried Rice. This recipe is an ideal for saving your left over Crispy Roast Belly Pork . Chaw Su wants you to leave some comments about her recipe and the result of your cooking. Egg Omelette ၾကက္ဥေမႊခ်က္ Quick and easy recipe for lazy day. Fried Bitter Gourd ၾကက္ဟင္းခါးသီးေၾကာ္ This bitter gourd vegetable has been used as alternative medicine for diabetic patient. It can also boost your immune system and should have that at the beginning of the winter season when many people sufer from cold and flu. Fried Bitter Gourd Indian Style ၾကက္ဟင္းခါးသီးေၾကာ္ Completely different style from www.pachakam.com. 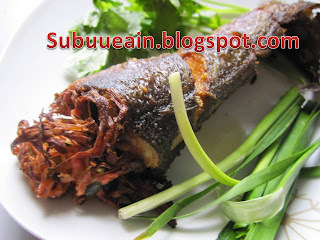 Fried Cat Fish ငါးခူဒုကၡေၾကာ္ Really easy to cook this delicious dish. Personally, I like this dish as my weekend lunch with plain rice. Some people said this might be a good idea for snack with beer or white wine. Fried Garlic Soft Crab ကဏန္းေပ်ာ့ ၾကက္သြန္ျဖဴေၾကာ္ This vegetable fried rice can be suitable for vegetarian if you substitute the prawn with other suitable vegetable. 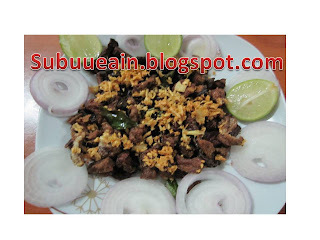 Fried Mutton ဆိတ္သားေၿခာက္ေၾကာ္ ေမႊးေမႊးေလး Another easy and delicious dish. Suitable for the kid because of there is no oil and chilli. Some people said this might be a good idea for snack with beer or wine.